Milton Academy is located just south of Boston. Hundreds of Milton Academy students staged a sit-in Tuesday at administrators’ offices, the latest in a series of actions protesting what students describe as racism at the prestigious school and a failure by school leaders to act decisively. High school students at Milton Academy say that in recent years racial slurs have been hurled at black students, hate-laced letters appeared in the mailboxes of at least two teachers of color, and pictures mocking black and Asian students were widely circulated on social media. A statement issued by a Milton Academy spokeswoman Tuesday evening acknowledged the challenges faced by the school, which was founded in 1798 and includes kindergarten through 12th grade. The statement noted that the protests took place at the high school. 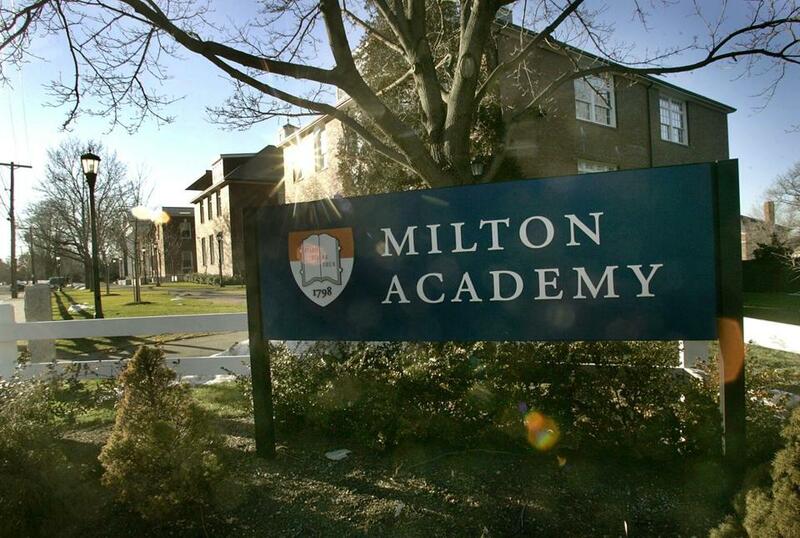 “Milton Academy’s administration is engaging with students and faculty in productive discourse and action, addressing the critical and challenging topics of identity, inclusivity, privilege, and race,” spokeswoman Erin Berg said in a statement. “This work is all aimed at ensuring a school culture true to Milton’s mission, in which all individuals feel safe, heard, valued, and supported,” the statement said. This week’s protests at Milton Academy, which included a walkout by students Monday during a school assembly and a sit-in by hundreds more that day, are the most recent instances of racial concerns at schools in Greater Boston. Mystic Valley Regional Charter School in Malden has weathered intense criticism in recent weeks for a dress code that civil rights groups and the state attorney general’s office say discriminates against black and biracial students. Amid protests, that school’s board of trustees on Sunday put on hold the part of the dress code addressing hairstyles. At Boston Latin School, the city’s prestigious exam school, a report released this month by civil rights groups indicated the school is not admitting enough students of color and, consequently, is not reflective of the school district’s racial diversity. Last school year, reports of racial harassment and insensitivity led to the resignation of Boston Latin’s headmaster. The letter, circulating among graduates and others in the school community, was signed by more than 100 alumni who graduated from 2008 to 2016. The pictures ridiculing black and Asian students surfaced a year ago but began recirculating on social media in recent weeks, according to a student. “This institution is supposed to stand unwavering behind students that are hurt, angered, and broken when the very values Milton Academy attempts to instill in them are disregarded,” the letter from alumni said. Parents of children of color at Milton say the school has failed to keep them informed about actions it is taking, or plans to take, to address longstanding racial tensions. According to the school’s website, 41 percent of students are people of color. Deval Patrick, the former governor of Massachusetts, is among the school’s famous alumni. “We will have meetings and we discuss things, but once you leave the meeting nothing is done,” said one parent who asked that her name not be used because she fears her child, who is in high school, will face retaliation. The parent said racial discord has worsened noticeably in the past year, and she traces the spike to last year’s divisive presidential campaign pitting Donald Trump against Hillary Clinton. “There has been a lot of chatter among the kids about who has voted for Trump and who voted for Hillary, and it’s given the kids a voice to speak out on both sides of this,” she said. Another parent who also asked that her name not be used said her child, who is in eighth grade at Milton Academy, is worried about racial conflict roiling the high school. “My child is afraid, saying, ‘I am going there next year, and is this what I am in for?’ ” the parent said. One student, a junior who asked that his name not be used because he fears retaliation, said administrators have failed to explain why they have not taken action against students who use racial slurs or mock black and Asian students on social media. “Myself and a group of kids have asked questions of administrators about why perpetrators of racism, why they are not given a [punishment] because we need to fight racism, and they were not able to give us a concrete answer,” he said.